Tegoshi ha gakkoi desuyo and he is cute too. In addition, he can sing very well too. Ganbatte ne Tegoshi-chan. Hope can finish watch his 15 sai no blues and his new movie!! He has a certain innocent and boy-ish air about him, yet a surprisingly deep voice. Amazing talent and control - he is definitely one of the strongest voices in NEWS. OMG!! he is seriously so cute!! i love him in yamato nadeshiko shichi henge!! so cute!! his smile is so adorable!!!!!!!!!!!!! and dude he sings so well!!!!! This boy is so pretty. Can't help but look at him. Loved him in My Boss, My Hero. I wish he would stand out a bit more in NewS. Sooo cool!! Wow...another cute and handsome actor/singer with a lot of talent! AND he is scorpio (lke me XD).. I like almost every drama he was playing. My fav news member. He has such a great singing voice! and from what i've seen so far, he's quite a good actor too! yay yay for tesshi! omg! !...even tho ppol say his d worst dancer in NEWS..he's acting in my boss, my hero was off d hook! !..it was aawesome!! OMG! He is so adorable in My boss, My hero. I heard that he had an awesome singing voice. Gosh! I so want to adopt him! He's like a pretty girl, i just saw him in mbmh but i have fallen for him so i hope to see him in more doramas. his is my fav johnny's soo cute!... wish he had a more joyful character in dramaz... and such a great singer! I love Tegoshi ever since I watched Summary..ever since that,I have been keeping track of all his shows.. He's really great voice, both in singing and talking, so it's obvious that he's good as an actor aswell. he really can act. REALLY. but, he always plays a depressed character. though he's quite genki ne..
likes his acting skills very much..and his voice..
will be a really BIG star in future. Super cute, GORGEUS voice, and also good at acting XD.. he's improving everytime I see him. Hes got talent and he looks soo kawaii>_< Cant wait to see the last episodes of his drama! 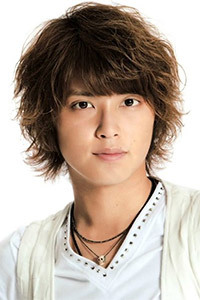 Tegoshi Yuya has awesome voice and nice looks! love his voice forever! kawaiiiiiii. he's really really good as actor. I love his Doramas! !